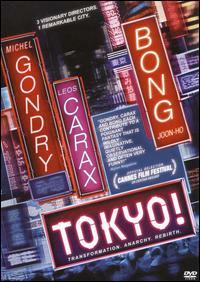 Directors Michel Gondry, Bong Joon-ho, and Leos Carax each direct a segment of this triptych feature about life in 21st century Tokyo. The saga begins with Gondry's segment, entitled "Interior Design," about a young couple who moves in with an old friend while attempting to establish themselves in Tokyo. Hiroko (Ayako Fujitani) and Akira (Ryo Kase) have just arrived in the city. They're eager to launch their careers, but first they'll have to find a place to stay. Though Hiroko's old friend Akemi (Ayumi Ito) opens her doors to the ambitious young couple, her boyfriend isn't exactly thrilled by the new living arrangement. As Akira takes his first steps toward becoming a filmmaker, the neon jungle beckons to Hiroko. Before long, Hiroko begins to experience a startling metamorphosis that instills her with a newfound sense of peace and purpose. The second chapter, Leos Carax's "Merde," follows the debased exploits of an unsightly subterranean creature (Denis Lavant) who emerges from the Tokyo sewers to taunt and torment the unsuspecting denizens of the city. Stealing cash, pilfering cigarettes, frightening old ladies, and even going so far as to salaciously lick schoolgirls, the gibberish-spewing troublemaker dubbed Merde sparks a media frenzy that sends all of Tokyo into a panic. The situation spirals as Merde discovers an arsenal of hand grenades in his underground lair, and begins throwing them in the streets at will, creating an environment of total urban terror. Later, Merde is apprehended and pompous French magistrate Ma�tre Voland (Jean-Fran�ois Balmer) arrives to defend the deviant in a Japanese court. The only person capable of speaking his client's unintelligible language, Voland stands at the center of a media circus that soon engulfs all of Japan. When Merde is convicted by the court and sentenced to death, justice takes a turn for the surreal.